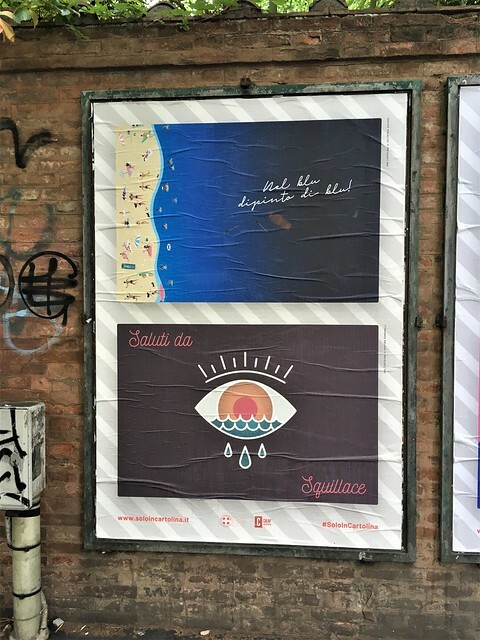 Bologna is a relatively big city, it’s a university city, and it’s a creative city. Combine those elements and it’s no surprise that you’ll often see protests and protest street art. Bleeding-heart liberal leftist socialist that I am, I tend to like a lot of it. The three countries I have family connections to — US, UK, Italy — all have crazy stuff going on politically right now. The migrant/immigrant crisis is a hotbed of argument in all of the countries and many others. While I’ve been fortunate not to be a migrant, I am/have been the child of an immigrant, the wife of an immigrant, and am now an immigrant myself. But oh, it’s different when you’re white and from the West. While the quote may have come from Trump, it echoes the sentiments expressed by a number of politicians. 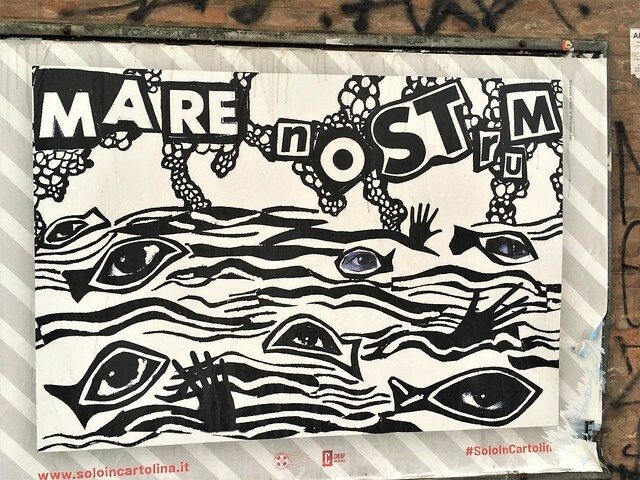 Italy’s government, particularly Deputy Prime Minister of Italy and Minister of the Interior Salvini, has been playing fast and lose with the lives of boatloads of migrants. He also said that migrants will only see Italy on a postcard. 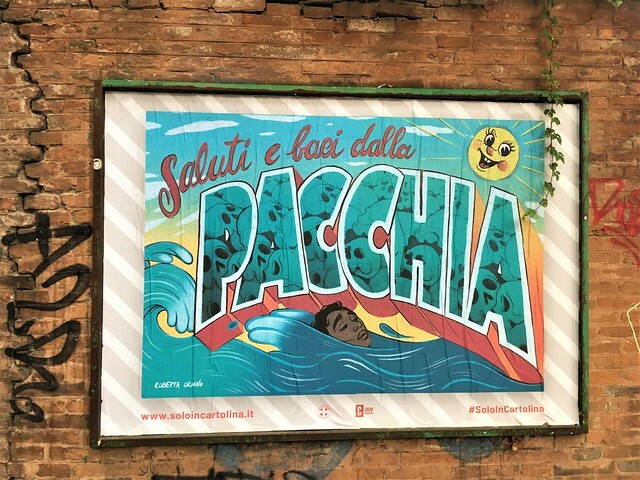 Milano, July 10th 2018 – Solo in Cartolina – Summer 2018 is a campaign against death at sea. 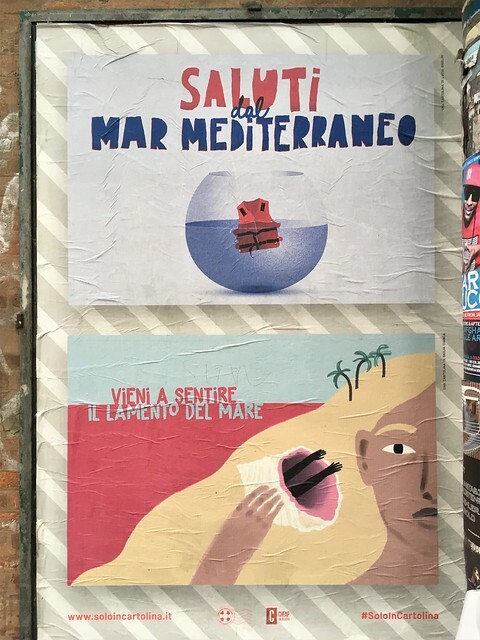 We want to forward 10.000 postcards to the Italian Interior Minister Matteo Salvini, who said about migrants: “they will only see Italy on a postcard”. NGOs and closing harbours are two recurring themes of this Italian summer. 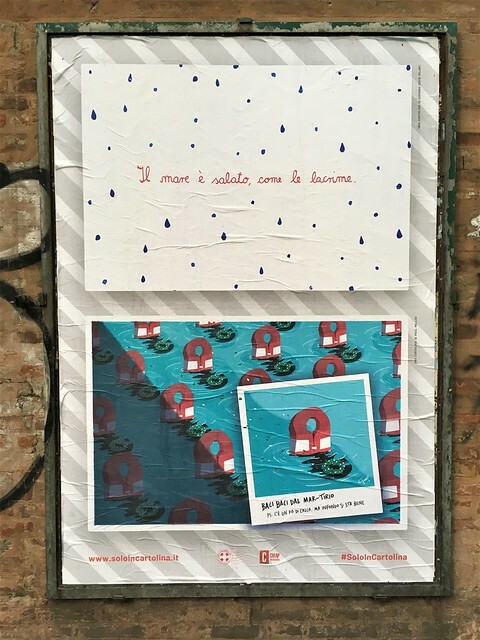 Solo in Cartolina – Summer 2018 is a campaign launched by a group of young Italian creative talents, denouncing what happens offshore Italian coasts. We stand with those who are saving lives at sea. The aim of Solo in Cartolina is helping who risks to die at sea. This is a priority and a duty, regardless the different immigration policies. The obstruction of the rescue operations is a violation of the human rights. And this cannot be ignored. 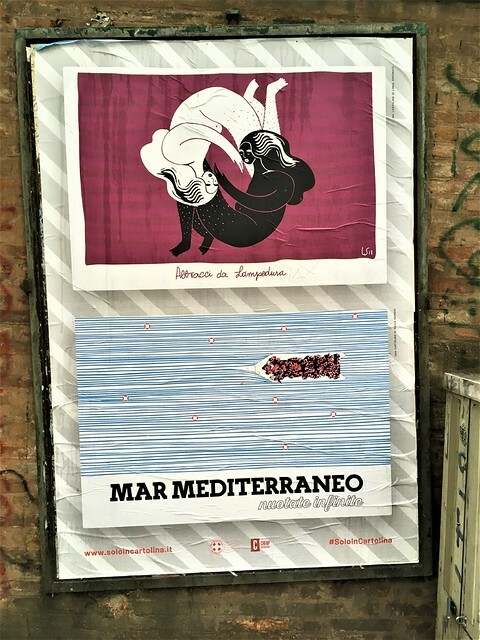 The campaign involves the creative community, and aims to denounce what is happening in the Mediterranean Sea, taking a stand and raising awareness on the ONG’s roles. Through the creative effort on each of the postcards sent by our contributors, we shed a spotlight on this dramatic situation. 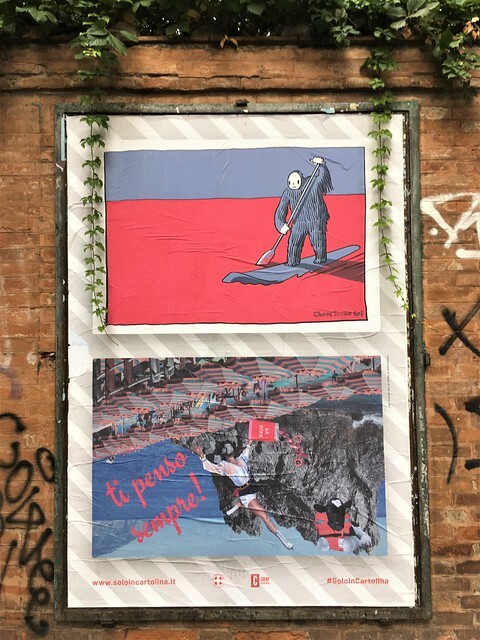 There’s a stretch of Via Irnerio here in Bologna where you’ll often see posters covering migrant topics in a variety of ways. 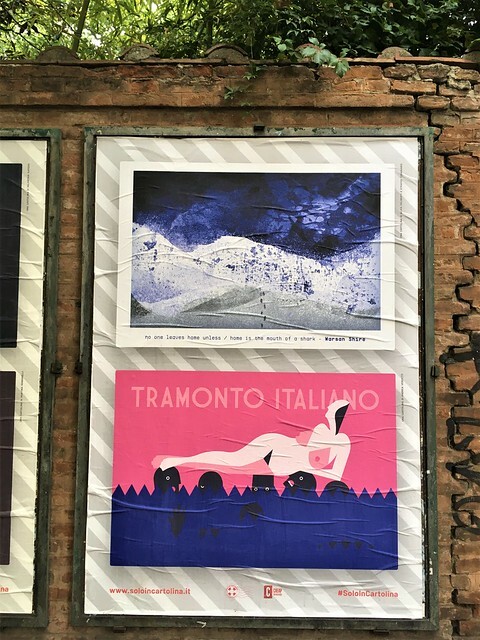 This summer, a number of the Solo in Cartolina images have been put up. I see them every day from the bus, but this past week, while taking Charlie for a walk, we headed in that direction to see them up close. 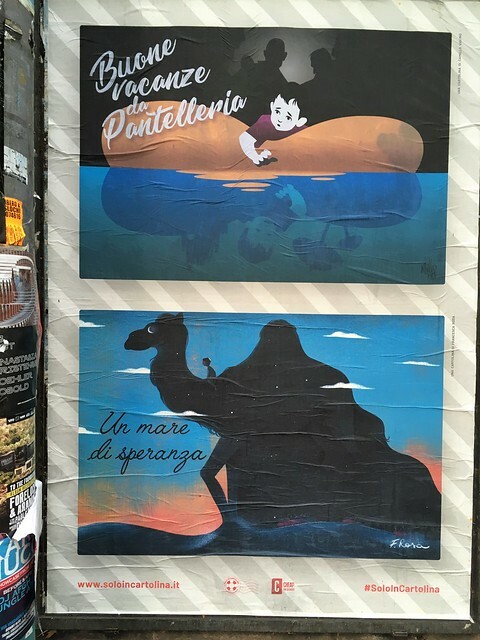 They’re done to mimic the various styles of Italian postcards over the years, but when you look closer and take in the images and/or words, it becomes drastically different. They’re surprisingly powerful. The following are shots of the ones on Via Irnerio. I suggest you look at the Solo in Cartolina website to see more of them. I’ll try to include some translations when possible. In general, saluti (greetings), baci (kisses), pacchia (fun/a good time). Obviously, it’s not an easy issue, but raising awareness and encouraging conversations, compassion, and new ideas is better than fearmongering.